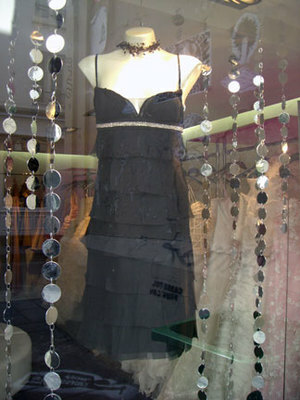 I pass by these shop windows all the time and I am astonished by the extravagance of the dresses in the window. I’m not sure who wears these creations, but it has to be a certain kind of bride that can carry it off. To me, they look more like wedding cakes with swirls of white butter cream. Not sure what the black cocktail number is. Maybe for a dark, wicked bridesmaid? 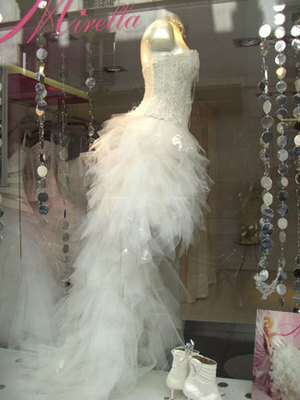 I went on their website www.mirella.fr and found a whole world of wedding fantasy dresses with names like Jasmin, Magnolia, Amelia, Tulipe, Mimosa, Nuance, and Hortensia. Let’s just say if you saw a bride coming down the aisle in a get-up like this, you would never forget her. 23 rue du Roi du Sicile, 4th arr. Wow! 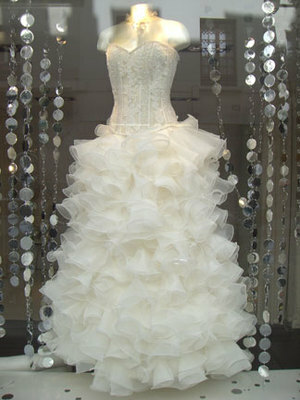 amazing absolutely wedding dress i like it so much looks so elegant love it,and the design really fabulous. Where can i but this?